Terrapins belong to the taxonomic order Chelonia, as do turtles and tortoises. While the name "turtle" is often used to describe all three kinds of these creatures, there is a distinct difference between them. Knowing the features and behaviors of terrapins will help you to identify one. Looking at a chelonian's habitat can help you identify whether or not it's a terrapin. Terrapins are semi-aquatic, meaning they spend some of their time living in water and some time on land. You may spot one in a swamp, river, pond or lake, or on land near a water source. These creatures only live in freshwater or brackish water, so if you see a chelonian in a marine environment, it's definitely a turtle, not a terrapin. Terrapins are much more brightly colored than turtles or tortoises, who are generally a solid brown or green. Terrapins usually have patterns on their shells and their bodies, which are often bright green or yellow in color. One of the most common terrapin species, the red-eared slider, has a distinctive bright red stripe on each side of its head, just behind each eye. You can identify terrapins by looking at their feet, which are different from those of tortoises and many turtles. Terrapins' feet are webbed between their toes, to help them swim, and have long, sharp claws for climbing. 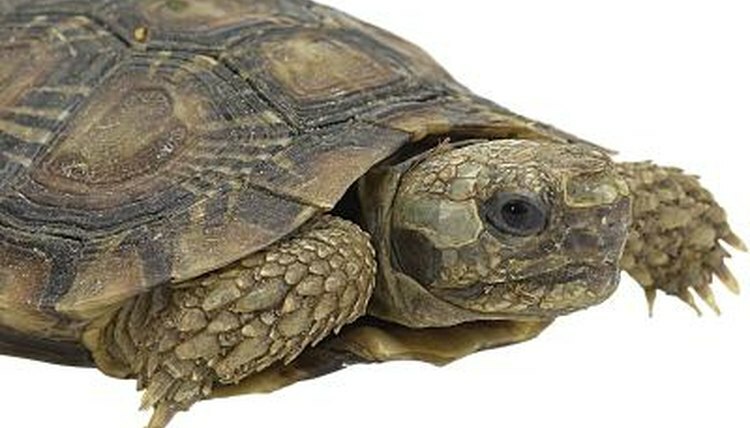 Tortoises' feet are designed for walking on land -- they're rounded and stumpy, and are not webbed. Many turtles don't have feet at all, but rather have four flippers that help them to glide quickly through the ocean. However, aquatic freshwater turtles have webbed feet, similar to terrapins. Terrapins' shells are different from those of other kinds of chelonians. Tortoise shells are high and domed, whereas turtle shells are flattened and streamlined, giving them less water resistance and allowing them to swim faster. Terrapin shells are somewhere in between the two; they're flatter than tortoise shells but more domed than turtle shells.